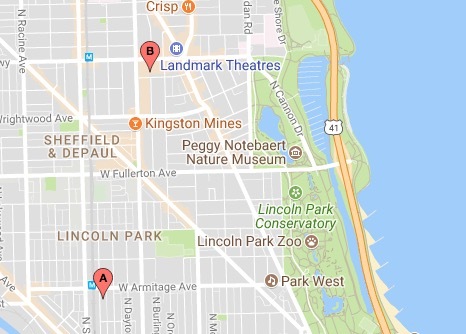 Three people were robbed within minutes of each other in Lincoln Park early today. No one is in custody. • At 1:56 a.m., a woman reported being robbed at gunpoint by two men and one woman in the 700 block of West Schubert. A witness reported that the trio unleashed a 30-second beating on the victim, punching her up to 10 times and kicking her repeatedly after she fell to the pavement. The offenders took the woman’s wallet and phone, then fled in a gray 4-door vehicle that was last seen heading southbound. Police later recovered the phone, which had been ditched in the 1500 block of North Lake Shore Drive. The victim was taken to a local hospital for treatment. • Passers-by called 911 for a man who was found “all cut up and bleeding” after he was robbed by four offenders near the Armitage Brown Line station around 2 a.m. The victim told police that two men and two women attacked him and a female companion in the 1900 block of North Bissell. After taking the victims’ phones and wallets, the offenders climbed into a gold Grand Am and fled the area. The suspects in both cases were described as young and black using the associated vehicles. Another robbery was reported in Lincoln Park early Monday morning. Two women robbed a man in the 600 block of West Wrightwood around 2:30 a.m., according to a report. The offenders fled the area in a gray Ford Escape that was last seen heading northbound on Clark and then westbound on Diversey. The victim lost his wallet, cash, and cell phone to the robbers who were described only as women.